Beautiful bay sunsets and a tranquil, laid-back environment are just a few of the many joys that come with being a bayfront homeowner in this nationally recognized, family-friendly beach town known as Ocean City, NJ. Positioned on the western side of this barrier island, the Great Egg Harbor Bay is yours to call home when you choose to purchase a bayfront property. Haven't fully decided on bayfront over beachfront or simply need some reassurance? With years of expertise, the Ocean City Property team knows bayfront living in Ocean City, NJ like the back of their hand. Here is what you need to know. One of the most important factors you’ll want to consider when choosing a waterfront property as your first or second home is the kind of lifestyle you truly want to be living, or at least the kind of lifestyle you want this specific property to serve. While the entire Ocean City community is popular amongst vacationers, residents and those who decide to purchase a second home, the bayfront area is certainly more popular amongst the later. Young families with vacation homes and retirees who’ve settled on Ocean City for their retirement home make up most of these calm and peaceful bayfront communities. Think you want to be closer to the sand, oceanfront and the hustle and bustle the Ocean City Boardwalk brings? We have all of the details on Beachfront living on our site, as well! Be sure to take a look or give us a call. Walkup bayside suited for catching crabs, private docks for your very own boat and storage space for all of your other water toys are just some of the luxuries popular amongst the majority of bayfront real estate in Ocean City, NJ. You will find some of the largest, finest properties and some of the highest price points in the bayfront neighborhoods making it ideal for residents set on an active and entertaining lifestyle. These homes are built to enjoy true waterfront homeowner experiences. While they are further away from downtown landmarks, such as the Ocean City Boardwalk, you are still more than able to pop over for an evening of fun and excitement. Regardless, all of Ocean City, NJ is a dry town. Therefore, you will be able to cozy up and find peace in your home or on your dock without being disturbed by any rowdy nightlife or club scenes. Are you starting to envision it? If you want to end days soaking in the sunsets and grilling dinner on your balcony while family members or friends park the boat dockside just until tomorrow, bayfront living in Ocean City, NJ is for you! If you are sold on Bayfront over Beachfront you are most likely ready to explore properties in Riviera or Bay Landings. These are the neighborhoods in which you’ll come to find the laid-back lifestyle described above. Don’t feel left to find your bayfront home alone! The Ocean City Property team has all of the up to date listing for single-family homes and condos available in these bayfront communities. Are you looking for bayfront homes for sale in Ocean City NJ? Owning a home on the bay means beautiful bay sunsets, a dock for the boat, and a place for the family to enjoy nature with its wonderful surroundings. 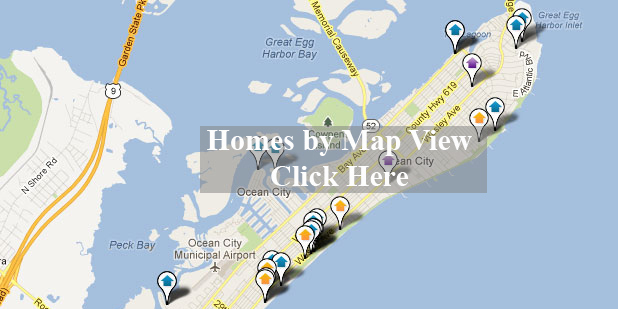 Click on the map above for all bayfront homes for sale in Ocean City. Contact us! Sign up to the right to receive free daily email alerts as they hit the market.